In the past, we’ve reported on the inspiring work of the Dominican Sisters of St. Catherine of Siena, and the courageous ministry being carried out under the leadership of their superior, Sister Maria Hanna. The sisters were among those driven from their homes by ISIS in August of 2014, joining more than a hundred thousand other Iraqis fleeing for their lives. The sisters settled in Iraqi Kurdistan. 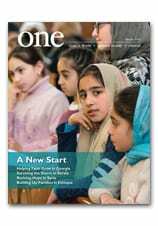 In our Spring 2015 edition of ONE, we chronicled their remarkable story of tenacity and grace. In addition to her work rallying her sisters and the people they lovingly serve, Sister Maria Hanna has been updating her friends and supporters around the world. She sent the following letter a few days ago, spotlighting the many challenges they continue to face, but also expressing gratitude for the generous support they have received-including, most prominently, from CNEWA and its operating agency in the region, the Pontifical Mission. The letter serves as a reminder of the hardships so many innocent families are enduring. But it also offers hope, revealing in a very personal way how CNEWA’s donors and partners are making a profound difference in the lives of countless men, women and children. With the New Year greetings, I extend my gratitude for your continuous support and prayers. Also, I would like to share with you our highlights from 2015. Thanks to the blessed efforts of people who are accompanying us, we have had an eventful year. In addition to accompanying the Internally Displaced Persons (IDPs) at the camps, sisters were able to prepare 400 children for First Communion in ten groups in different cities and towns in the region of Kurdistan. We are grateful to the Lord that our efforts to open a primary school were fruitful. Eventually, we managed to get all the licenses needed from the Iraqi and Kurdish governments. Bishop Warda (the Chaldaean Bishop of Erbil) offered us a building that Catholic organizations built on property belonging to the Archdiocese of Erbil, and the Pontifical Mission [CNEWA], thankfully, furnished it. There are about 460 pupils — girls and boys and all are IDPs. Seven of our Dominican sisters are working at the school, with other teachers and administrators, also IDPs. Studying at our school is free. The salaries of teachers and staff (about $18,000 a month) have been granted by the Pontifical Mission [CNEWA] for this year. People are thankful and happy for this project, as the condition of other schools is really miserable. Because of the large number of the IDPs, some schools have three shifts a day, each shift for different groups, and the number of pupils in a class could number more than 80. Also, we managed to open another kindergarten for the IDPs as there is more demand this year. The families prefer to send their children to be educated by the Dominican Sisters. Now there are 440 children attending our kindergartens in Ain Kawa. Additionally, in a town called Aqra with 250 IDP families, we opened a kindergarten for 50 children. The kindergarten in Kaznazanalso has 130 children in attendance. These kindergartens are free of charge for the IDPs. In both projects, school and kindergarten, sisters have been noticing much improvement in children’s behavior. They are more willing to listen to their teachers and it is easier for teachers to discipline the children. The schools are equipped with playground and a sport field, which gave the children a suitable environment to play and direct their energy. However, people are still facing many challenges. As for the present condition in Iraq, it is still traumatic. We were shocked last month when seven individuals (parents with their 7-year-old son, and 3-year-old daughter and a lady with her 7-year-old son and 13-year-old daughter) drowned in the sea as they were trying to flee to Greece. Everybody is physically and psychologically exhausted. It does not seem that there is any solution. People risk their lives. Immigration is increasing in all directions. Just before the end of the year, families of 167 persons were placed in Slovakia (at once) as part of immigration program, and there are more to go in the coming month. That, of course, shook the Dominican Sisters of St. Catherine Of Siena [and also shook] the confidence of people about the future of Christianity in Iraq. Add to that, there are other families who are leaving the country [to go to] Lebanon, Jordan and Turkey. In a matter of three months the number of children in our school fell from 520 to 460; also about 15 children from the kindergarten left with their families and more are planning to leave. Although we are sad to see people leave, people who are living in prefabricated houses are facing a tremendously hard time, especially now in winter as these houses are not healthy at all; they are not made to contain large families, neither are they equipped for such harsh weather. They are extremely cold in winter, extremely hot in summer. The recent news about the policy in the Middle East is not encouraging at all; nether is there anything promising. Everything is unknown and uncertain. Therefore, it is not surprising to see people leave. We pray that the doors of divine mercy may open for our brothers and sisters, that they may find people who could welcome them. As for us, we remain with the remnant here, to support the people intellectually and spiritually through educational projects and liturgical meetings. Within the community, we are thankful for all those who helped us purchase a house which provided a better environment for our young sisters in formation program.We have started preparing for our general chapter that is planned to be held in July 2016. We ask your prayers that God may enlighten us and grant us His wisdom to discern in our reality despite all the difficulties and pressures we are living. To help support Sister Maria Hanna and her sisters, and the vitally important work they are undertaking on behalf of our brothers and sisters in Iraq, please visit this giving page. And please: keep them all in your prayers. Thank you! Picture of the Day: "You Can't Go Further"
Note: Last summer, we reported on the controversy surrounding the building of a separation wall in the Cremisan Valley. Yesterday, a group of bishops visiting the region attempted to visit the area. Carl Hétu, National Director CNEWA Canada, is accompanying Bishop Lionel Gendron of St-Jean Longoueil, Québec, vice president of the Canadian Conference of Catholic Bishops — and he describes below what happened. On our way to visit the Christian community of Beit Jala on Sunday, property owners invited the Holy Land Coordination bishops delegation to visit their land. As the bishops were about to enter the first property, an Israeli jeep came to block access. The delegation was told that they couldn’t go further. The bishops prayed and then left to join the parishioners for Mass nearby. The bishops had come to show their solidarity with the 55 local Christians families who are about to lose their land and their livelihoods. The farmers harvest olives, apricots, nuts, figs and much more. This will be a substantial loss of revenue for them and another loss of high quality land for agriculture. Last April, the farmers were rejoicing over an Israel court ruling which had rejected the building of the wall. But in a surprising and unusual decision, the court reversed its judgment in July and ruled in favor of starting the wall. Since August, the Israel Army has been uprooting ancient olive trees, some hundreds of years old, and preparing the land for construction. As the bishops left the area to celebrate Mass with the Beit Jala local parish, they could hear the echoes of earth-moving machinery echoing through the valley. You can read more about the troubled history of the Cremisan Valley here. And there’s more about the bishops’ visit to the region here. The village of Madaya is a part of the east Ghouta region, along with Zabadani and Serghaya. This cluster of villages has witnessed fierce combat between the different fragments of the opposition on one hand, and the Syrian regular army supported by the Iranian guards and Hezbollah fighters on the other. This area is strategically important for its location. It is very close to the Lebanese border, and also to the Syrian capital of Damascus. Located near the Beirut-Damascus highway, who controls the area controls the smuggling of arms and other items. Two years ago, the Syrian government made a strategic decision to besiege all villages and towns bordering Lebanon in the hands of the opposition. They were successful in recapturing all villages of the so-called Qalamoun area. As a result, the fighters of the opposition were pushed either to Lebanon or to the Ghouta villages, mainly Zabadani and Madaya. Supporters of the opposition also sought refuge in there. Syrian government and Hezbollah sources have stated that scores of trucks containing humanitarian aid are scheduled to be sent to Zabadani in January. The first wave of trucks carrying medical and food stuffs were sent to Madaya. But, militant groups allegedly confiscated them and sold them to the inhabitants at a very high price. Yesterday, the United Nations said it had received “credible reports” of people dying of starvation and said that the Syrian government had agreed to allow aid convoys into the besieged cities of Madaya, Foah and Kefraya. Sources add that this is a partnership between the WFP, the International Red Cross and the Syrian Arab Red Crescent and that aid would be enough to sustain 40,000 people for one month. Finally, the situation is extremely difficult. The inhabitants are suffering, especially now in winter. The cold is another killing agent to be added to the mines besieging the town and thwarting aid efforts. We contacted some leaders from the local church and they all stated that the only intervention right now is exclusively by the Red Cross and the United Nations. A church initiative is not possible at present because the political and military situation is very delicate. If There is Will to Build Lasting Peace"
Editor’s note: the following appeared this week in a column in Canada’s Catholic Register. During recent travels in Beirut I met Kamal and his family, Syrian-Armenian Christian refugees. They told a harrowing tale. There are more than 12,000 Syrian-Armenian Christians currently living in Lebanon who share a similar story, forced to flee in fear under dark skies. These are urban refugees who share a common experience: as minority Christians, they have suffered persecution for their faith. As such, families such as Kamal’s should be given priority under government-sponsored programs that are bringing 25,000 Syrian refugees to Canada over the coming months. For his children’s sake, Kamal desperately hopes to be able to take his young family to Canada or Europe, but anywhere that is safe will do. As Canada begins to receive 25,000 government-sponsored Syrian refugees and as many as 10,000 who are privately sponsored, there is no peace in sight in the Middle East. The self-described Islamic State appears to be as strong as it was a year ago despite heavy bombing by several Western states, including Canada. But the reality is that defeating ISIS will only matter if there is a genuine political will to build lasting peace in Iraq and Syria. It is good policy as well as a wonderful humanitarian gesture for Canada to welcome Syrian refugees, but the lack of peace and increasing political unrest means there will be even more refugees and more Christians knocking on the doors of the international community in 2016 and beyond. P.S. Limsana, a primary-school student at Ashabhavan, takes in the scenic vistas surrounding her school in India, which serves children with special needs. To discover why things are looking up for the students there, read Kerala’s House of Hope in the Winter edition of ONE. In this image from 6 January, Syrian civil defense team members in Aleppo hold banners as they gather to protest for civilians who starved to death in Madaya, Syria. The Syrian government has agreed to allow aid into the rebel-held village. The Orthodox community in the Alaskan village of Tatitlik was greatly affected by the ecological disaster that resulted from the wreck of the Exxon Valdez in 1989. North America is a mosaic of ethnic groups and religions. Orthodox Christians are a tiny minority — about 0.65 percent — and include no more than three million of an estimated 460 million people living in Canada, Mexico and the United States. What they may lack in volume, however, North American Orthodox Christians make up in variety. They comprise immigrants and their descendants from Asia Minor, the Balkans, Europe and the Middle East, as well as Alaska Natives and recent converts, especially from the reformed churches. The ancient rites of the church of Byzantium unite these Orthodox Christians. Rooted in the New World for more than a century, these North American churches retain strong bonds with the Old World, are divided into a number of ethnic jurisdictions — Albanian, Arab, Belarussian, Bulgarian, Greek, Romanian, Russian, Rusyn, Serbian and Ukrainian — and typically celebrate the divine mysteries in their respective liturgical languages. One body has attempted to transcend these cultural differences. Originally a jurisdiction of the Orthodox Church of Russia, the Orthodox Church in America was established in 1970 and is led by a primate with the title of archbishop of Washington, metropolitan of all America and Canada. Supreme canonical authority in the Orthodox Church in America rests with a synod of bishops from the 14 jurisdictions that compose this autocephalous, or independent, church. In addition, the Orthodox Church in America includes ethnic Albanian, Bulgarian and Romanian eparchies and jurisdictions in Canada and Mexico. In English-speaking Canada and the United States, English is the norm in most liturgical services. Yet other languages may be used depending on the pastoral needs of the parish.